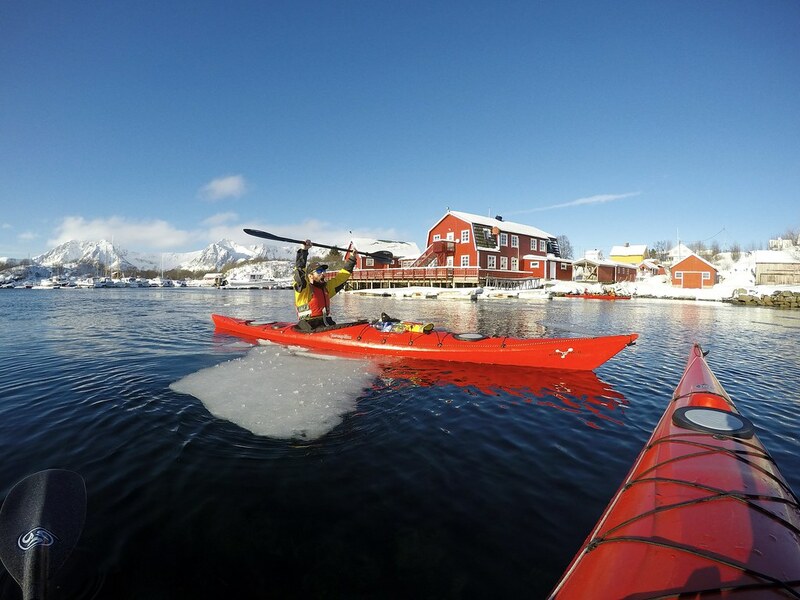 After three months back in the Arctic we’d only managed to get out on the kayaks once and that was in the peak of winter. We had very limited daylight, the sun wasn’t rising at all so after a bit of a pink hue touched the clouds the sky quickly darkened. The sea was completely flat and mirrored but the water was black and eery. Thankfully an opportunity popped up recently for us to head out with our pals and we were all so excited as spring was finally approaching and the sun was high in the sky. It was a perfect day, about -5 degrees, no wind and calm sea…but it was so calm and cold that the whole bay outside our property had actually frozen. It was the same conditions the day before and we could throw pebbles through the thin ice. But on this very day the ice was so thick that a rock bounced off and sat on the glistening surface. It should have been enough to tell us that we wouldn’t be able to kayak but we were so excited for the good weather that we got ready anyway. Craig headed out first from the frozen beach and instantly struggled to move. 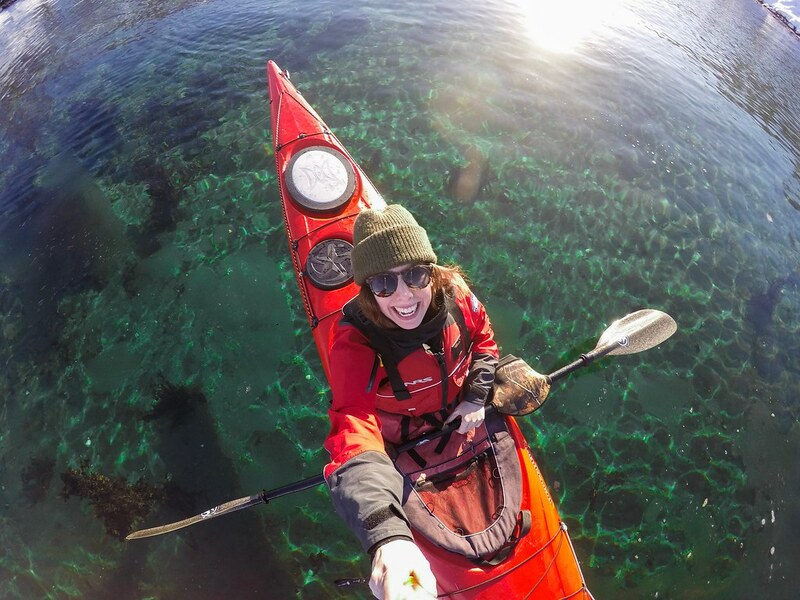 The ice was causing him to wobble precariously so Chloe who is a kayak guide wadded into the sea in her drysuit and smashed through the ice with her paddle. It was working but it was tough and we didn’t know if the sea would just freeze over again on our return. 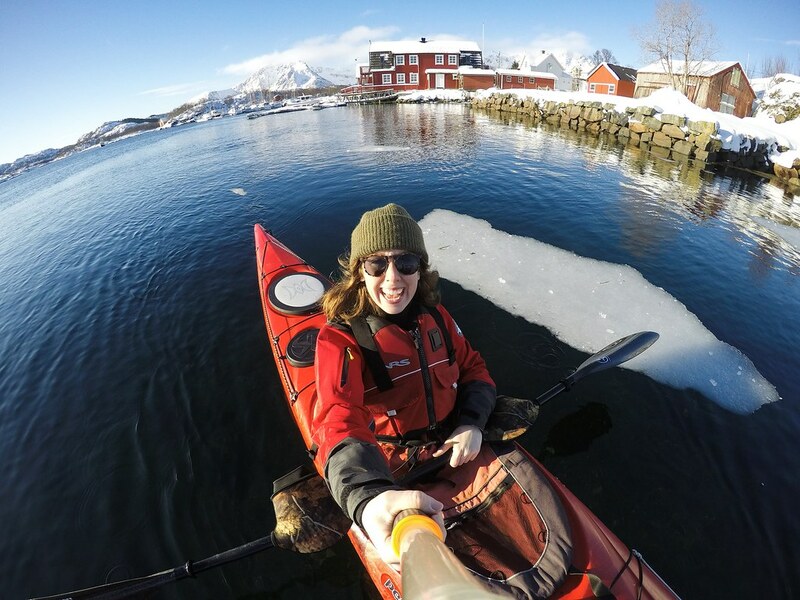 We realised the ice was thinner by the jetty so Chloe tried launching off the end and breaking the ice with her paddle while on the kayak. Sadly it was a lost cause, we had to admit defeat on what we thought was the perfect day. It really sucked as it took a long time to prepare all the gear and some of us had already got our suits wet which meant we also had to rinse everything afterwards without the benefit of using the gear. 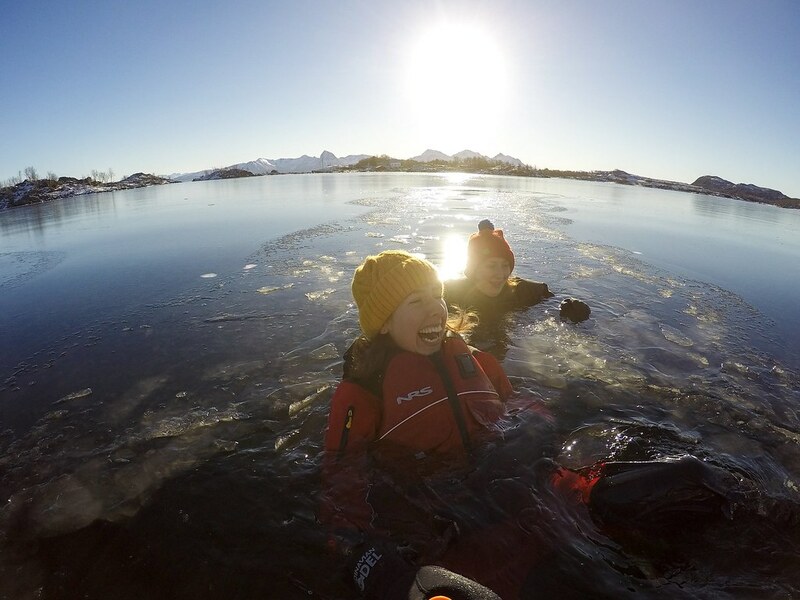 Luckily I have some pretty crazy friends who suggested swimming so three of us slipped off the jetty into the area Chloe had cleared of ice. 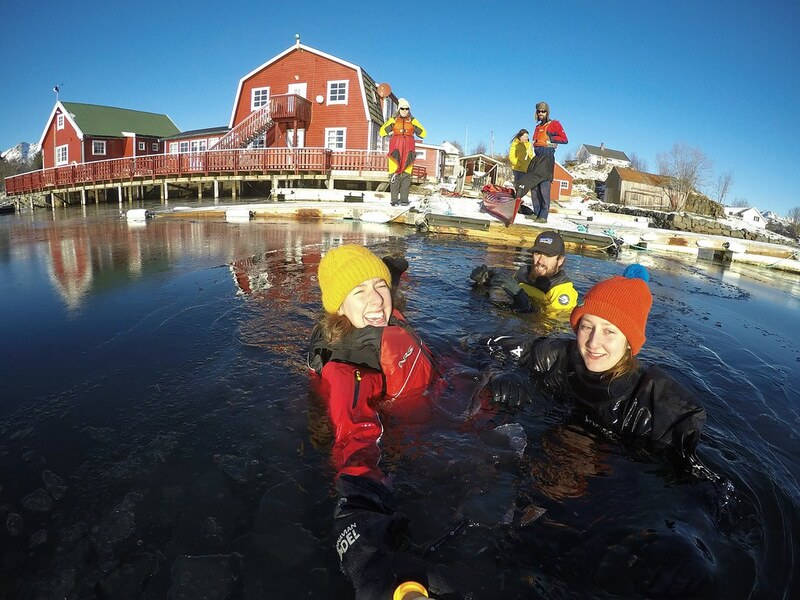 It was a very strange sensation being in the water in a dry suit as it instantly vacuum-packed around my body and I couldn’t control where my legs floated to. 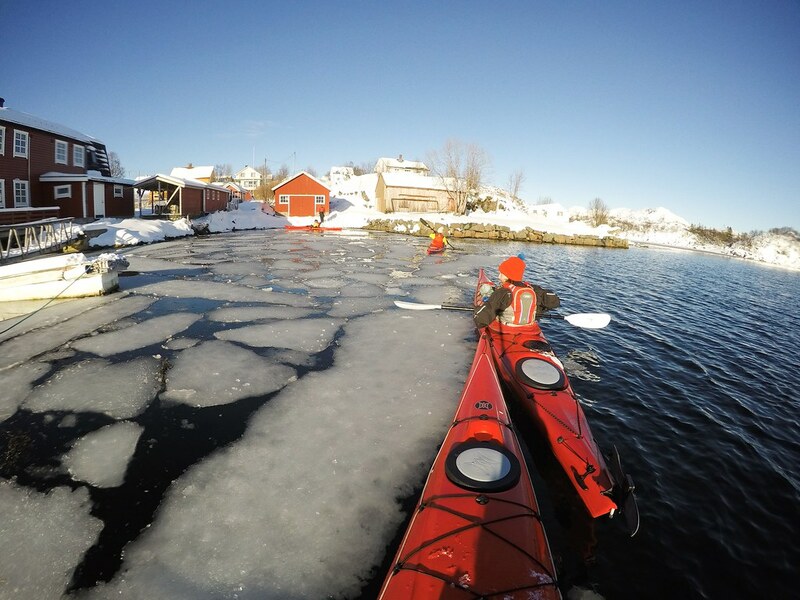 It ended up being a very funny experience bobbing in the frozen sea and smashing the icy edges away with our hands. But it was cold, my suit was a bit too big for me and water seeped in through my neck and slowly tortured my body with cold water. At least we managed to make a little activity out of the day but we were still unsatisfied and awaiting the next opportunity to paddle. A week or so later the ice melted and we headed out on the water. 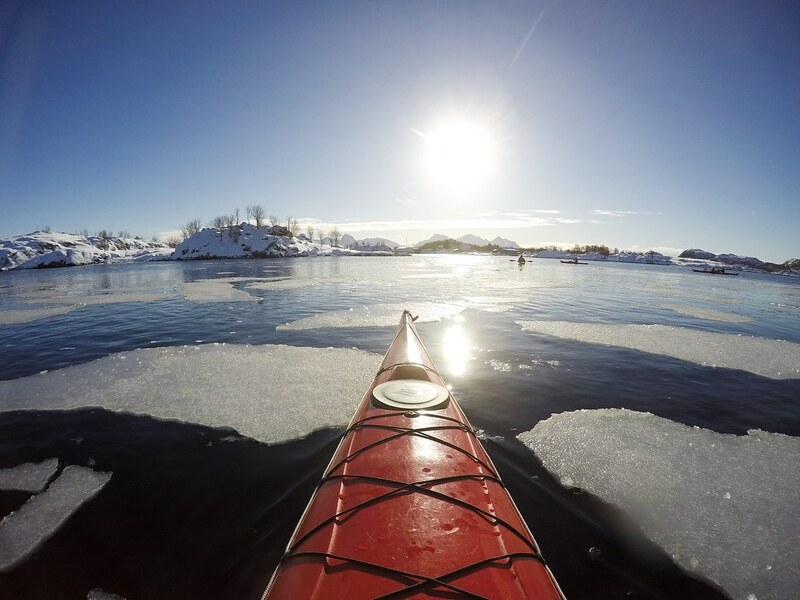 There were still a few sheets of ice floating around which were fun to kayak over as they broke in half. A curious seal followed us for a short period, poking his head out of the sea and watching us before diving down and reappearing in a different location. The sea looked incredible in the sun and the shallows were perfectly turquoise. 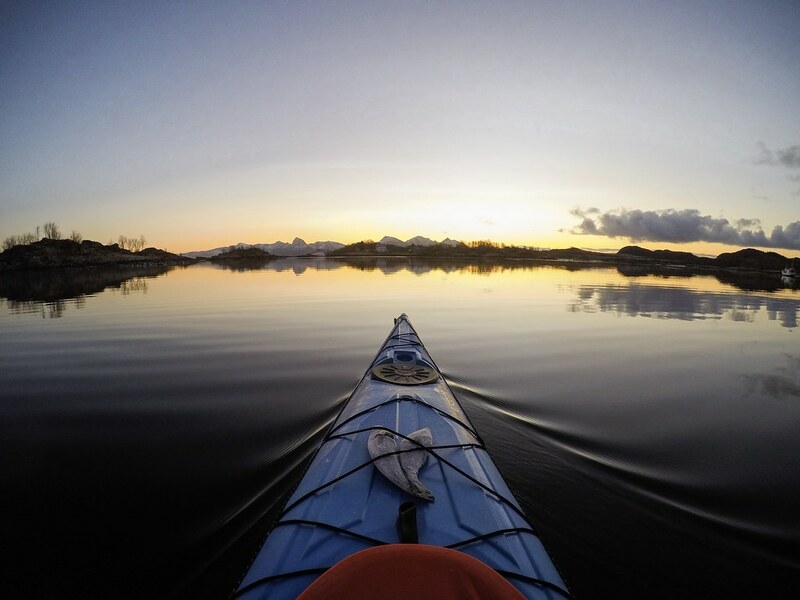 We paddled between snow-covered islands where we could see tracks from otters sliding down into the water. 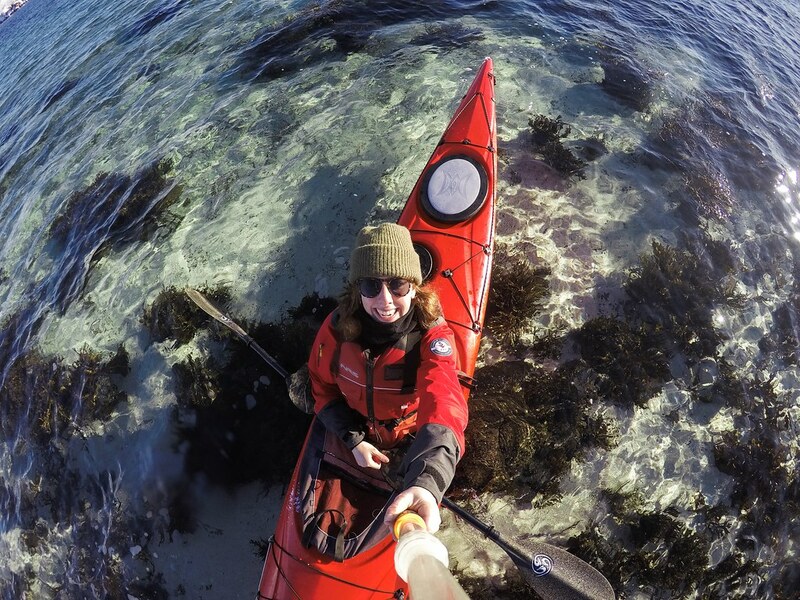 When we veered around one island the sea became pretty choppy and paddling became a bit of a challenge for me. My arms were already aching and with the added wind I was struggling a bit and eager to reach our halfway goal of a hidden beach on an island. 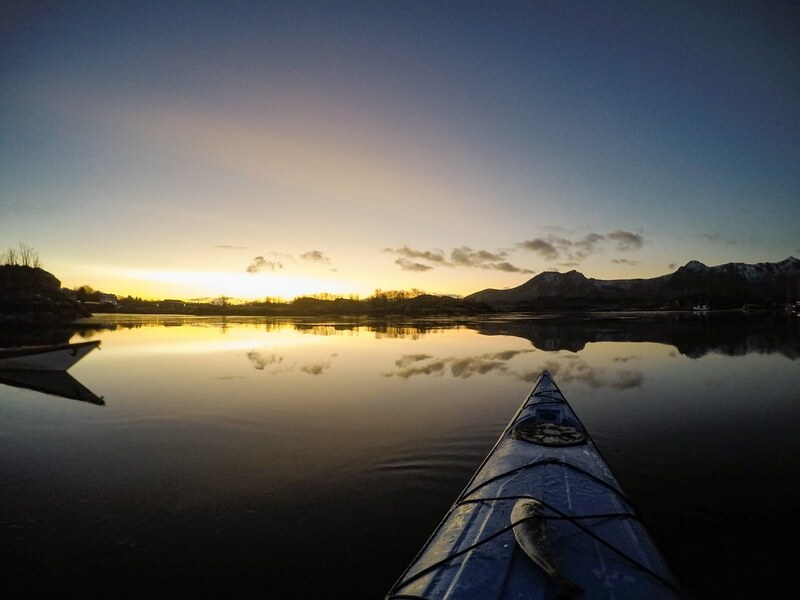 It was hard to locate in winter as snow was covering the sandy shore but we power-paddled towards the beach until our kayaks were resting on the land. 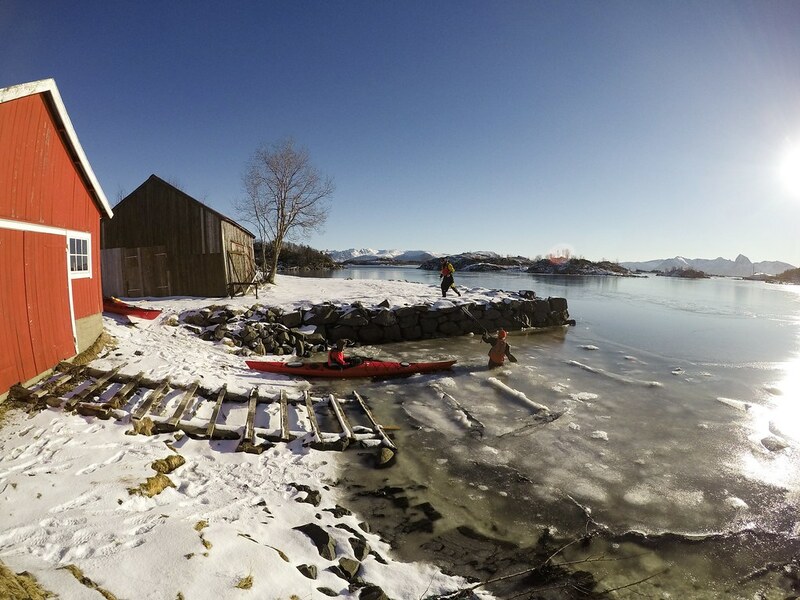 It was such a perfect setting for lunch but bloody cold when we stopped paddling. 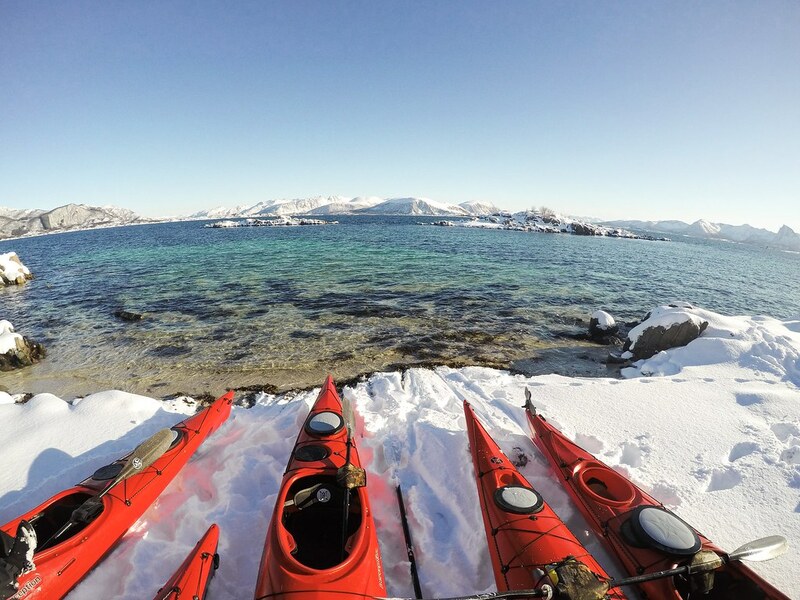 Even walking through the snow in the wetsuit shoes was unbearably cold so we sat in the kayaks to keep our feet off the ground. My hands were numb from eating without gloves and they throbbed with pain when they started coming back to life again. 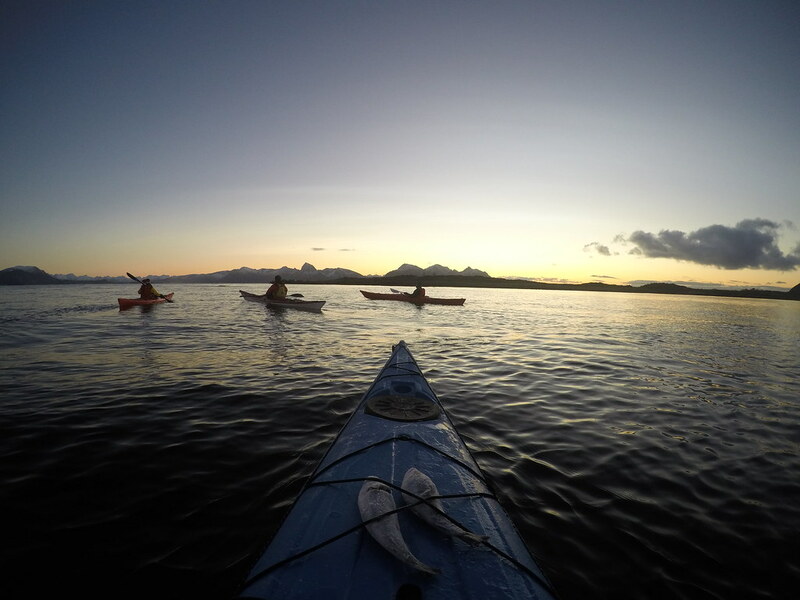 But it was so great to get out on the water, to escape to a new place and get some fresh air and a bit of exercise.